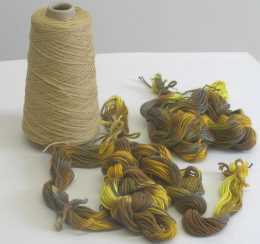 This kit includes two hand painted warp chains 36 threads wide and 8 feet long; and one cone of 4/2 Dragon Tale cotton yarn for winding additional warp threads, and for weft. 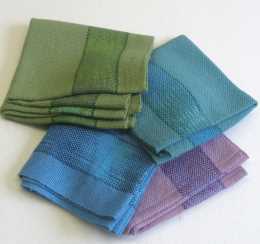 It will make two 15” x 28” towels, or one 15”x 58” runner, woven in plain weave at 12 threads per inch. Instructions are included, also available here. Skills needed: winding additional warp threads, warping your loom, weaving plain weave fabric. Add items to your shopping cart by entering quantities in the olumn of boxes (right-most but one) and clicking the Add To Cart button at the bottom of the page. The cart does not calculate our discounts. We will e-mail you a detailed confirmation copy of your order with all discounts applied.